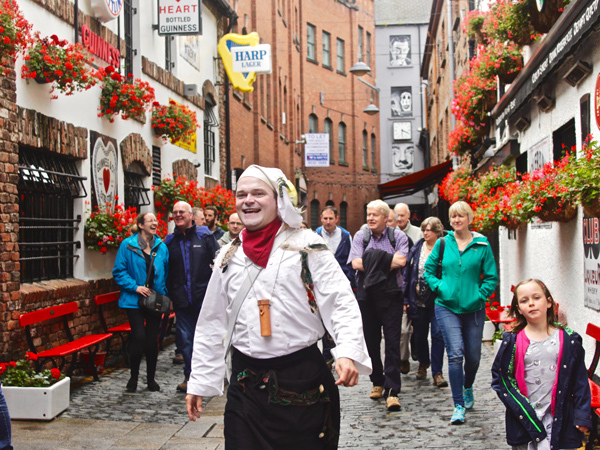 FOODIES along with city historians united under wet skies on Saturday for Kabosh Theatre Company’s Belfast Bred walking tour of the city’s cuisine haunts from past to present. Our band of early morning risers converged outside Belfast’s oldest deli, Fountain Street’s Sawers, were we met with “chef Barney” whose mission was to get our help sourcing and collecting the ingredients to make a sumptuous dinner “aboard the floating palace” the Titanic. Fair enough. We were promptly introduced to “scrap of a lad” Sawers propertior Kieran Sloan who told us that the food emporium “first came to Belfast in 1897” and stocks such delicacies as caviar, foie gras, cheeses from around the world, gourmet tea and coffees and game. Treated to slices of fresh Belfast Bap and rashers of Pat O’Doherty’s speciality Fermanagh black bacon, samples of octopus, goats cheese and Yellow Door breads were also offered along with olives and chunks of Pastels de Nata, Portugese custard tart. Sunshine broke through the clouds as we headed for Bank Square and learnt that the area, now home to Mourne Seafood Bar, Kelly’s Cellars and the weekly Folktown Market, used to be home to the ‘Fadgies’ who would come up to the north from Omeath to sell oysters. Barney explained how the street would be littered with oyster shells, which at the time were known as the “the poor man’s food”. Bowls of salt and chili squid with homemade ‘slaw – and a warm welcome from Mourne co-owner Bob McCoubrey – greeted us as we took a seat inside the restaurant to learn that the reason why our fish is so good is because the Irish Sea is emptied twice a day by the tide. The squid at Mourne really is a stand out, coming from Kilkeel with their seabass coming from the Carlingford coast. It was then onto the John Hewitt pub as manager Gerry White explained that the bar was charity-owned and that musicians from Seasick Steve to Mumford and Sons had all graced the stage. Gerry spoke of how the bar is home to over 14 beers coming from artisans such as Hilden, Whitewater and Yardsman. With sample tasting of locally crafted beer and cider this reporter’s ears pricked up at the mention of the newly launched Jaw Box Gin. Brewed in Kircubbin, Gerry explained how “as a gin drinker” this is only one for him and how it should be served with ginger ale and a wedge of honeycomb… note to self. From the John Hewitt it was onwards to “Belfast’s own Fleet Street”, Commercial Court which houses the Harp Bar, Duke of York and Dark Horse bar. With a quick change of the lights we walked to Belfast’s finest Georgian hostelry dating back to 1711, and home to the Belfast Boxty, McHugh’s Bar. Servings of the traditional Irish potato cake were served with shavings of Belfast ham and mature Coleraine cheddar; our table was served the Boxty with braised Ards Peninsula leeks and wild mushroom cream. The party was also treated to pieces of sirloin steak cooked on one of the famous McHugh’s volcanic rocks which are heated to 450 degrees and basically means you can cook it how you like it. The final stop was at a heaving St George’s Market, the biggest smorgasbord of them all for those who were still hungry to sample some more of our finest produce. Belfast Bred is a great way to explore the city, learn something new and try some really great locally produced and farmed food along the way. The combination of culinary tales and the leisurely walk around the city centre builds up a good appetite. Special mention must also go to Chef Barney, brilliantly played by Kabosh actor Stephen Beggs who, despite the weather, kept our spirits up and our party together.